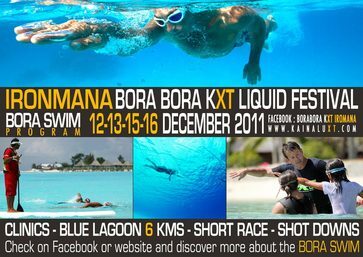 B&B IS GOING TO BORA BORA in December 2011... You want to join us ??? Every night there is live music at happy hour for you to enjoy the beautiful sunsets in paradise. The festival ends with a buffet dinner & A Bora After Dark Farewell Party. It promises to be a tonne of fun in an idillic location. A B&B swim will be available everyday in these beautiful waters !